A suspect yesterday surrendered after a miner from Buxton, East Coast Demerara (ECD) was shot twice in the city last Saturday when he pursued two men who robbed him of a gold and diamond chain. Police said, the 44-year-old man, of Middle Walk, Buxton, was a passenger of a route 44 minibus at the bus park on Hinck Street, Georgetown. The identity of the man was not revealed. However, police said investigations revealed that two robbers, including one armed with a handgun, pounced on the miner and relieved him of his gold and diamond chain, valued $950,000, and fled in the direction of the Stabroek Market. In an effort to reclaim his chain, the miner chased behind the men but during a confrontation at the Stabroek Market, the gunman fired several rounds, hitting him on his left hand and buttocks. The miner was then taken to the Georgetown Public Hospital, where he was treated. He was later discharged. Yesterday, police said one of the suspects turned himself in on Wednesday in the company of his lawyer. The suspect, of South Cummings Lodge, ECD, has since admitted to committing the crime and also to the ownership of an unlicensed firearm with five live rounds. 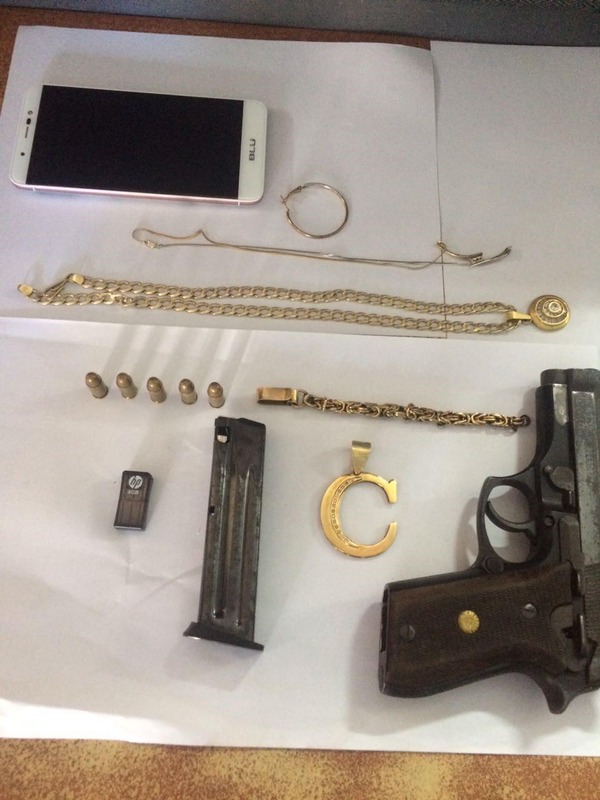 The gun, ammunition and jewellery were found in a car that was abandoned, in close proximity of the crime scene. Police had the vehicle towed to the Brickdam Police Station last Saturday. It was searched in the presence of its owner, who claimed to have rented the car to a Kitty resident since last July. Efforts are being made to have the other suspect arrested, police added.